Claire Moulds asks some of Ireland's leading wedding photographers what you really need to know before you book. “Having a realistic budget to work to and understanding what means most to you when allocating it is crucial when planning a wedding,” confirms Fionn McCann of studio33weddings.com. “One of the most important things to look for in a photographer is experience," says Fionn. "While not essential, choosing someone who has shot your venue beforehand is advantageous as they know what works and what doesn’t and how to get the best out of the setting. If your photographer isn’t familiar with your chosen location then check what additional prep they will do beforehand. “Beautiful photography is all about great light!" explains Seán Lordan of Into the Light. 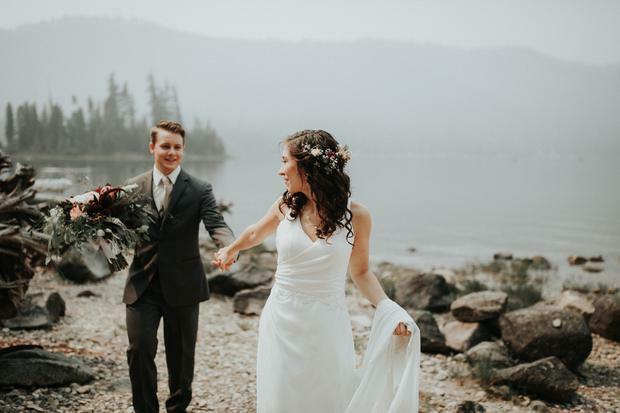 “When planning a wedding the amount of vendors available can be staggering," adds Seán, and you can easily find yourself lost in a sea of choice. “We shoot in a mainly documentary style,” explains Paul Mongan of Moat Hill Photography, "which involves capturing the essence of the day in an authentic way, rather than directing or setting up improvised moments. When it comes to family photos we try to keep to four main photographs – bride and groom with parents, both sides, and with families, both sides. “There is no doubt that a photographer has to get creative in bad weather – both inside the venue and out – and experience counts for everything in this situation,” adds Paul. “If you’ve never booked a professional photographer before, it can be daunting,” says Lou McMaster of The Lou’s. "That’s why it’s important to do lots of research. Look closely at a wide variety of different images on a photographer’s site, at the composition, the lighting and the overall effect. If he or she has a blog, scroll through as many of the weddings as you can as it will give you a really good sense of how they work. “Once you’ve decided on the style you like then it’s just as important to make sure that you get on with your photographer," Lou adds. "They will be by your side for most of the day, so you want to feel comfortable and relaxed in their company. “Compiling a timeline with your photographer is essential,” advises Tanya Cullen of Bronte Photography. “A good tip is to give them ‘time out’ within the schedule to be creative. After all, if you fill their day with a big list of pictures of you with every single guest then they won’t have the time to create the beautiful images you saw in their portfolio. If you chose them for their particular style, you need to give them the space to recreate that at your wedding. And a final word of advice from the Irish Brides team! Just because the photos taken are of your wedding, it doesn’t mean that you own the rights to them. Always check with your photographer exactly what they are willing to allow in terms of future usage before you sign any contracts.